Amazon launches Prime Music streaming in the UK | What Hi-Fi? Amazon's music streaming service offers access to more than one million tracks including playlists and personalised recommendations. It's available across Amazon's range of Fire electronics plus Android and iOS devices. Following on from a successful Amazon Prime Day packed with offers and deals, the online shopping giant has just launched its music streaming service, Amazon Prime Music, in the UK. You'll need to be a subscriber to Amazon Prime (a £79 annual fee) to access the service. Once you're signed up, you can access more than one million songs to either stream or download and play offline. You can combine your new choices with any exisiting music already stored in Amazon's cloud. On paper, the numbers don't seem as impressive as Spotify's catalogue of 30 million tracks or Tidal's 25 million, but it does work out cheaper over the course of a year - and of course you get the other benefits of Amazon Prime (free next-day delivery for many products bought on Amazon's online store, and the rather good video streaming service). 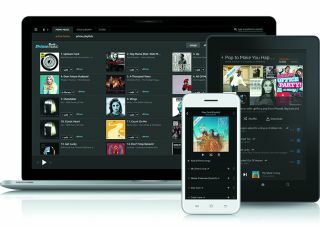 The music service is available across Amazon's complete range of devices, including the Fire HD and HDX tablets, Fire phone, Fire TV and Fire TV Stick. Android and iOS users can get involved by downloading the Amazon Music app for their smartphones and tablets. You can search and navigate Amazon Music via artist, album and track, click on Prime Playlists or use Amazon's personalised recommendations to discover new music. The bitrate for Prime Music is 320kbps MP3 compared to the 256kbps AAC bitrate allegedly being used for Apple Music and the 320kbps Ogg Vorbis used on Spotify. According to Amazon there's no provision to alter the bitrate of your stream or the music stored on your devices for offline listening, a feature that's already offered by Spotify.